Victoria Azarenka during her ladies singles quarter-final match against Serena Williams at Wimbledon 2015. Tatjana Maria, ranked No.93 in the world, acknowledges that she sometimes does think of her daughter Charlotte, now 3, between points. Victoria Azarenka jokingly complained that her six-month-old son, Leo, doesn’t seem to care much about her sporting prowess. Late June, the former World No.1 tweeted a picture of Leo playfully nibbling at some paper, completely oblivious to mommy hitting balls some distance away on the Aorangi Park courts, the practice courts at the AELTC. Azarenka, 27, returned to tennis as a wild card with the Mallorca Open in Spain on 19 June—in preparation for Wimbledon, starting 3 July—after more than a year away from the game. She last played at the French Open in 2016, retiring in the first round with an injury, and before she could go ahead with the grass-court season, she found out she was pregnant. Professional players at the top of their game have to stay focused, driving all their energy into that next point to be won. But when you’ve just had a baby, things can be different. As a hands-on mother, Azarenka admitted recently—when she made an appearance at the French Open in Roland Garros for a children’s event—that she would find it difficult to leave little Leo behind, though he would be in the safe hands of boyfriend Billy McKeague or a nanny. Leo changed Azarenka’s life; and the impending arrival of another baby is poised to shake up the women’s tennis scene. Azarenka’s buddy from the women’s tour, Serena Williams, is on her own maternity break—which she announced after winning the Australian Open in January, when she was already eight weeks pregnant. With Maria Sharapova out injured, former champion Petra Kvitová returning to tennis gingerly after a knife attack last year, and other top players looking inconsistent, Azarenka’s return to tennis seems to be timed just right. It comes at a crucial juncture in her career, which was peaking when she left to start a family. Azarenka belongs to that rare breed of players who have made a return to full-time tennis after a brief or longer stint at full-time motherhood. Kim Clijsters of Belgium went the furthest, winning three (of her four) Grand Slam titles after she had her daughter, Jada, in February 2008. She had retired from tennis in 2007 to get married and returned to the tour in 2009, winning the US Open that year—the first unseeded, unranked female champion and the first mother to win a major since 1980. Before her, in an era when there was less stress on athleticism, Margaret Court, Evonne Goolagong Cawley and, more recently, Lindsay Davenport, returned to tennis, winning Grand Slams and/or other titles before finally hanging up the racket. Two years ago at Wimbledon, for example, the mothers ruling the glorious grass courts included Australian Casey Dellacqua, Tatjana Maria of Germany, Russian Evgeniya Rodina and Kateryna Bondarenko of Ukraine. There were several mothers in the doubles competition as well. They included Cara Black, Klaudia Jans-Ignacik, Maria José Martinez Sánchez and Katalin Marosi. Even though the circumstances are vastly different, let’s cast an eye on the men for a moment. There are plenty of fathers who are racking up titles and scoring high rankings after fatherhood—Roger Federer, Novak Djokovic, Andy Murray and Stan Wawrinka, to name a few from the current set. Federer, for example, could show up at a tournament a week after his second set of twins were born, and continue to play a sharp game. The challenges for playing mothers aren’t just the logistics of childcare, they are also about managing time, travel and identity. Professional sport requires hours of training and practice, and playing countless tournaments across the world to maintain form and rankings. Motherhood, and the attendant changes to their bodies, can complicate the decision to return. “Before I had (son) Reggie (in 2014), it was all about me, me, me, competing and making sure I am training and everything is going right for me," heptathlete Jessica Ennis-Hill was quoted as saying in a 2015 Independent article ahead of the 2016 Rio Olympics—where she won a silver medal. “Now it is not me, Reggie comes before everything else, but I am still really competitive." Azarenka reportedly schedules her training around breastfeeding. 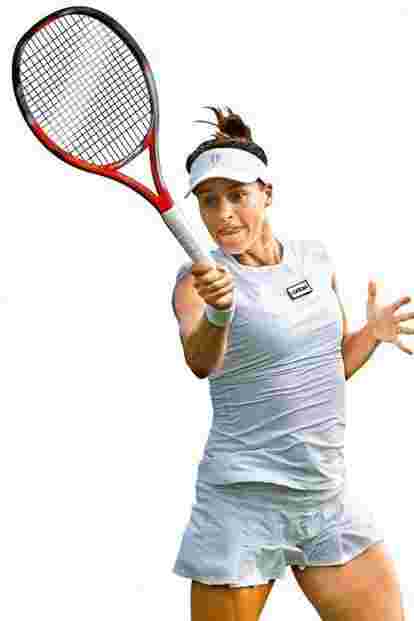 Dellacqua had to take turns with partner Amanda in trying to put a restless Blake to sleep before a second-round match at Wimbledon 2015, she told The New York Times. “There are many (challenges)," says Marosi on email. “I could write a novel of it but most importantly, time management, setting priorities, and help from grandparents." Williams, 35, told CBS that she definitely plans on coming back, although the earliest she can return is next spring. Williams is one Grand Slam short of the all-time record, Margaret Court’s 24, which would seal her status as the greatest woman tennis player ever. Many athletes treat pregnancy as a break in their careers, not really the end of it. “When I was pregnant with Charlotte, it was clear from the beginning that I will come back after my pregnancy. Because we knew also right away that we were going to travel together," says Maria, 29, who played at the 2013 Wimbledon when four months pregnant and returned to competition four months after delivery. She went on to reach her career-high singles ranking of 62 in July 2015. This year, she lost in the second round of the French Open to finalist Simona Halep. Charlotte is “always with us and when I have a match, she is always close, so I know that she is fine". Azarenka will get a protected ranking of No.6, according to Women’s Tennis Association rules for a player returning to competition after a break. She will also be able to get into eight tournaments, including two Grand Slams, in the next 12 months. The biggest challenge for her, says Maria, was starting from zero, vis-à-vis tournaments. Additionally, she had changed her game from a two-handed backhand to a single-handed one. Practice is one thing; playing a match is always different, says the German. In 2014, when Marosi returned to tennis after a short break when she had her son Csaba, she definitely seemed to enjoy playing more than before. Her game hadn’t changed, her mental approach had. Once ranked 101 in singles, she resumed playing only with doubles. During her pregnancy, she didn’t think she would return to tennis. “For us it was pretty easy," says Maria, “because we have a tennis court at home. So when Charlotte was born, we could go on the court when she was sleeping or if we had a little bit of time in between. On tournaments, we have most of the time someone from the family with us who can also look after Charlotte (grandmother, uncle, aunt....)"
Family, obviously, plays an important part in the readjustment. Maria says her husband and she share the home tasks and plan their work schedule together. “We were and still are in opposite shifts when possible," she says. However, both Marosi and Maria admit to being distracted, at times, when competing. “I did think about (Csaba) while playing. And it was a blessing having him outside the court watching my match and running towards me after I finished," says Marosi, 37. Maria adds, “I would tell anyone that it’s the best feeling in life to get a family and I would tell them to do it. We are travelling all the time with Charlotte—she is always with us. “She is part of my tennis. Since the first day, it was clear that we are doing it all together or we are not doing it any more."